The Hood River Valley High School Health Center is backed by a team including the Site Administrator and Medical Provider, Kristen Nicolescu, PA-C, Dr. Natalie Speck, Medical Director; Maja Addinton, LPC, Behavioral Health Consultant; Judy Villalobos, CSWA, Behavioral Health Consultant; Melody Farrell, Certified Medical Assistant and Magali Lara , Team Assistant. This welcome team and resource operates during the school year, serving all students within the Hood River County School District. 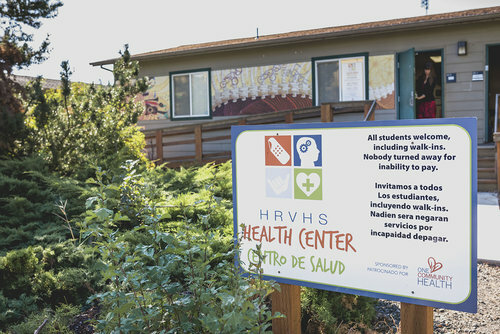 All high school students, as well as all other students living within the Hood River County School District, are welcome at the School-Based Health Center. Parental Notification – Hood River Valley High School Health Center Satisfaction Survey: Students between the ages of 12 and 19 who visit the school based health center (SBHC) may be asked to complete an anonymous survey after their visit. The survey asks about the student’s satisfaction and experience at the School-Based Health Center (SBHC), as well as some general questions about their physical and mental health status. Students can refuse to take the survey and this will not affect their ability to get care at this SBHC. To see a copy of the survey, please go to the “SBHC Data Requirements” link on http://healthoregon.org/sbhc. If you have questions about the survey, please contact the SBHC State Program Office at sbhc.program@state.or.us. Questions? Please call: 541-308-8345; 541-386-6380, after hours.